Arranged in Tuscan- style, located in a 19th century house (in Italy: palace) on a quiet alleyway (no through traffic) in the historic district of Massa Marittima. The rooftop terrace (deck chair, table and chairs) can only be reached through this apartment and offers a vast view over the idyllic roof landscape down to the sea and will be perfect for sunbathing, feasting and relaxing. Also from inside the bedrooms you will enjoy a gorgeous view of the historic city wall and the hilly landscape leading down to the coast. The comfortably arranged apartment (90 m²) has a spacious living room/kitchen (dishwasher), a comfortable living and dining room with a wide round arch, 2 bedrooms, a modern bathroom and a separate WC. The apartment was carefully and stylishly modernized. The original cotto flooring, the high set wooden beam ceilings (in all rooms), the historic ceiling paintings and variety of antiques add a special charming touch. Ideal location during every season: The apartment is an ideal starting point for Tuscan- explorations during every season: the gentle, sunny winter, the blossoming spring, the summer ideal for swimming, the warm, aroma rich fall. No matter if your are mostly interested in the culture, in taking a relaxing bath, in photographing the landscape’s beauty or being tempted by the local culinary specialties: you will feel at home while staying at our comfortable and tastefully arranged apartment. There are heating options available for the winter. Especially appealing is having a glass of wine on the rooftop terrace while enjoying a view of the sunset or having dinner at the atmosphere-rich cathedral square and enjoying the Tuscan- specialties. Also historically known places are easily reachable for one day trips due to the good highway connections. For example, Siena (60km), Florence (120 km) or Pisa (100 km). Tips on parking options are displayed at the apartment. Enjoy wine in a pinturesque landscape: Drive along the 'Strada del Vino' and taste (and buy) wine and olive oil directly from the farmers. Of special interest for wine lovers is the small city of Montalcino with its gorgeous old city district. It is the origin of one of Italy’s best wines: 'Brunello di Montalcino', which is matured in oak barrels and can be tasted everywhere on site and in the surroundings. You might combine a dégustation with a walk, a several hour hiking tour or a bicycle tour through Maremma's original landscape (rides). A special attraction are the hot water springs of Saturnia and Petriolo (bathing options). Massa Marittima is, due to its central location, best suitable for restful purposes and is located near to the sea and serves as a starting point for the sightseeing of famous Tuscan cities. There is also the possibility to explore many small and appealing places in the nearby surroundings, where you will run into few tourists. The bathroom has a spacious shower, WC, bidet and sink (first- class arrangement). The apartment also offers a separate WC with a large sink, so that you won’t run into each other during 'rush hour'. Both bathrooms were fully modernized and tastefully arranged in a typical Tuscan- style. The antique wooden beams give this room a special touch. In order to make you feel comfortable, there are shelves and many hangers in both bathrooms. You have enough storage room and hanging options for your personal belongings. The bright and roomy living room- kitchen (large eating table with a granite counter, a counter for work, and a travertine counter) is fully equipped with tableware and cooking utensils. You can cook a complete meal there if you would like, nothing needed will be missing. In spite of the first- class arrangements, there is enough room for your personal belongings (inside the pantry for example). The apartment was designed throughout the years with much love and in a Tuscan style (and is still being designed following that theme). Although our personal touch clearly manifests itself, we try to offer our guests a lot of room for freedom. You will find flat areas everywhere on which you can spread out and overtake the 'property’s ownership'. We are glad when our guest feels well and also if they are able to enjoy a nice vacation at our gorgeous apartment. The positive response (coming also from former guests) gives us security (see guestbook). Bed linen, bath towels and dry towels can be rented upon request. A detailed and often beloved city map offering many tips (trips, restaurants, shopping...) is displayed at the apartment. Heating service is available during the cold winter months. Your contact will be on site (for questions) lives a floor down. We would be glad to send you our little brochure. Kommen gerade aus unserem Urlaub in Massa Marittima zurück! Wir waren begeistert! Die Wohnung ist perfekt ausgestattet und sehr geräumig. Wir haben uns auf der Stelle wohl gefühlt! Es wurde auch absolut an alles gedacht, es gibt nichts was fehlt (Bücher, Spiele, alles was man in der Küche braucht...)! Die Lage im Zentrum ist auch perfekt. Man kann direkt von der Wohnung aus am Abend gemütlich ins Städtchen spazieren, wo einem viele tolle Restaurants erwarten! Wir können diese Unterkunft nur weiterempfehlen! Die Wohnung ist wie in der Anzeige beschrieben. Die Lage -nur ein paar Schritte vom Domplatz entfernt- ist super. Es ist alles da, was man braucht. Ein kleines Minus war lediglich, dass der Sonnenschirm auf der Dachterrasse nicht funktionstüchtig war, so dass man diesen traumhaften Teil der Wohnung nur bedingt nutzen konnte. Wir waren nun schon das 2. Mal hier in der Wohnung in Massa, und sicher nicht das letzte Mal. Die Wohnung ist wunderbar gelegen, top ausgestattet, großzügig und alles hat reibungslos funktioniert. Das Highlight ist natürlich der unvergleichliche Ausblick über Massa bis hin zum Meer von der Dachterrasse aus! Sehr empfehlenswert, um echtes italienisches Urlaubsfeeling zu bekommen! dem 3. Tag schon von Nachbarn freundlich gegrüßt. Wir hatten eine wunderschöne Zeit und kommen sehr gerne wieder in diese Wohnung in dem bezaubernden Massa Marittima zurück. Auch diese Bewertung freut uns sehr, denn sie ist eine schöne Bestätigung dafür, dass die Wohnung durch Einrichtung, Ausstattung und Lage die Bedürfnisse unserer Gäste an erste Stelle setzt. Dadurch haben wir zahlreiche Gäste, die als "Wiederholungstäter" immer wieder kommen. Und die freundliche und aufgeschlossene Art unserer italienischen Nachbarn haben wir diesem wunderbareb Land zu verdanken! Es war erholsam und gemütlich - und die Vermieter waren ausgesprochen nett und unkompliziert ---- wir kommen gerne einmal wieder! Vielen Dank noch für den Prosecco! Ps: Auch unsere Kinder haben sich sehr zuhause gefühlt! Danke für die tolle Rückmeldung! Wir freuen uns besonders, wenn die Großen und Kleinen unsere Wohnung so genießen! Tolle Wohnung, sehr schöner Ort - fussläufig zu erreichen. Alles so, wie auf den Bildern im Internet beschrieben. Wir haben uns superwohlgefühlt. Kommen gerne wieder! 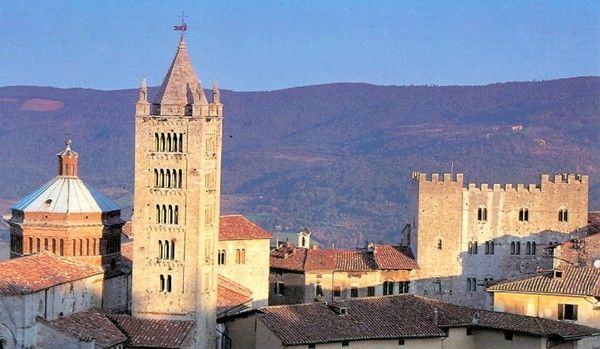 Massa Marittima is a special, appealing village rich in medieval and gothic influence located in the Tuscan hilly landscape nearby the sea (18 km). When you step outside the house you get the feeling of being part of the cast in a film set in the Middle Ages. Despite its quiet location it offers many cultural attractions (museums, etc. ), appealing shops (boutiques, art and antiques). You can enjoy a typical local dinner for a moderate price or a pizza on the plaza (no traffic, children can romp around.) Whether it be the appealing city lights on the facade of the famous cathedral or the view when looking at the medieval palace, you will understand why this spot is mentioned in many travel guides as one of the most beautiful places in all of Tuscany. And yet Massa Maritima is not an overcrowded place, it has kept the charm of a typical Italian small city and you can easily travel through it (stroll around, have ice cream, etc.). Golf: Two of Italy´s most gorgeous and exclusive golf courses are located near Massa Marittima ('Golf club Toscana' and 'Golf club Punta Ala'). The 18- hole courses are playable throughout the whole year and are located in the middle of vineyards and the olive groves. They are specially designed with small lakes, waterfalls and with typical plants from the south. The courses are just 10 and 20 km away and also offer a yacht and tennis club. Here you can connect a special, golf experience with a spa and culture vacation in an ideal fashion. Der Mietpreis ist ein Inklusivpreis (Strom, Wasser, und Gas sind enthalten) Bettwäsche und Handtücher werden Ihnen kostenlos gestellt. Die Endreinigung beträgt einmalig 50€. Sollten Sie in der kalten Jahreszeit heizen wollen, treffen wird Ihnen dafür lediglich der Heizmittelverbrauch in Rechnung gestellt. Haustiere sind leider nicht erlaubt.